Every entrepreneur should understand and know a few basic business and startup terms. They’ll help you understand how a startup business is launched and funded. These business terms will also help you understand whether or not any money invested in a company is making a return, or how much money a company has available to spend on different areas of their business. Total addressable market, or TAM, is the number of revenue generating opportunities for a specific product or service offered. It also considers how much of the current available market is already being served, and the number of potential customers that can be reached through marketing channels. HIPAA regulates health insurance policies and creates standards for securing the privacy of health information. Seed capital is the money used starting out to fund a startup company. Seed capital can come from a variety of different sources such as crowdfunding, venture capital, business loans, personal loans, family and friends, and grants from business associations and the government. Seed capital is very important to entrepreneurs in the beginning stages of their startups for the obvious reasons. It allows entrepreneurs to develop their product or service, form a team, and progress their business model. Crowdfunding, or crowdsourcing allows entrepreneurs the opportunity to present their business or idea to an entire community of potential investors who can then decided to invest funds in that entrepreneurs business or startup. Currently, the JOBS Act allows startup companies to raise up to $1 million in funding from crowdfunding sources. Bootstrapping is when an entrepreneur personally invests his or her own money into the startup without help from outside sources. When an entrepreneur bootstraps it shows they’re fully invested in their startup and have complete faith in their business succeeding since failure could personally ruin them financially. An Angel Investor is normally a wealthy investor who was also a successful entrepreneur in the past. Their great knowledge and past experience allows these investors to not only give startups funding, but also mentor entrepreneurs and give them advice, which can be even more valuable than the funding itself. Private equity is generally when private investors seek to support and add value to startup companies through long-term investments. Venture capital is a common source of private equity. Return on investment is a crucial term that all entrepreneurs should be familiar with and monitored frequently. Return on investment (ROI) lets business owners know whether or not they received a return from the capital they invested into their business. Any capital that was invested into the company and used to purchase assets, which were then used to generate revenue from sales. The revenue produced from sales gets used to cover the business’s operation expenses and if there’s anything left over after expenses are paid, the business has a profit. To calculate the Return on Investment take the profit and divide it by the total amount of capital that was invested into the company, and that equals the return on investment or ROI. The greater your profit is compared to the total amount of funding invested into the company, the higher your ROI will be. These are all the revenue generating assets a business has, like facilities, machinery, vehicles, and equipment. These assets are what keeps the business running and are used to conduct the everyday operations of the business. Working capital are any funds a business has that can be spent freely. To calculate the working capital a business has, take its current assets (short-term funds) minus current liabilities (short-term liabilities) and that equals your working capital. For example, if you had $50,000 in current assets and $35,000 in current liabilities, your working capital would be $15,000. Every entrepreneur should have a good understanding of a few basic business and startup terms. 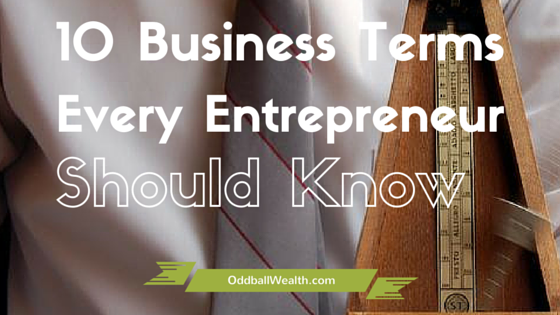 We go over the top ten business terms every entrepreneur should know.